Later this year we may offer full kits or possibly assembled versions. 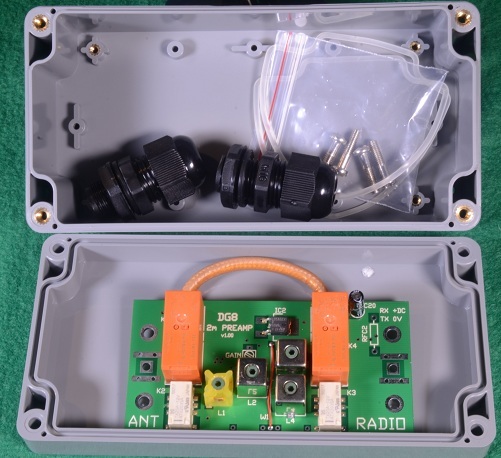 The concept is based around removing the connectors that are found on the majority of masthead pre-amps, as these are difficult to weatherproof effectively, and are extra sources of loss, especially on the antenna side. 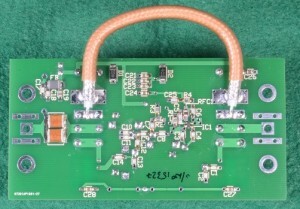 Instead, the cable from the antenna, and the cable from the shack are run into the pre-amp through cable glands and directly terminated on the pre-amp PCB. The supplied housing for the unit is a weatherproof plastic box, which can be taped or strapped to the support boom of the antenna, and can be close to the antenna feed point, thus minimising any cable losses between the feed and the pre-amp. If you need to use connectors, for example on the run to the shack, then use in-line connectors – these are much easier to weatherproof effectively. Switching relays are included giving a TX power handling capability of up to 750W, a NF of approx 1.2dB for the entire preamp, including relays, and an input intercept (IP3) of +10dBm. These figures apply to the DG8-2, 144MHz version. For the 70MHz and 50MHz versions, the NF values are below 1.5dB – Tx power handling is increased to around 1kW at 50MHz. All control and DC is supplied via the coax feed from the shack – so no extra cable runs are needed. A suitable Bias Tee with matching power handling capabilities is available for the shack end of the installation. 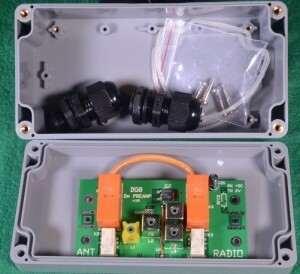 For the detailed technical article on the pre-amp, please go to Ian’s website The housing supplied with this kit is fully weatherproof, and is intended for direct termination of cables on the PCB. If you prefer to have a connectorised unit, then you will need to separately obtain a suitable metal box, and a larger external weatherproof box – these are not available from me. 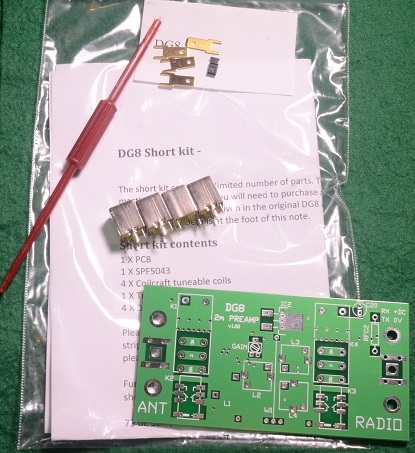 The DG8 PCB will take standard N type connections, but you will need to use spacers between the box and the PCB to clear the components on the top side of the PCB, and a ground strap between the case and PCB to ensure a low impedance RF ground connection between the two. Assembly kits are supplied with a permeable vent, which solves the problem of placing electronics in housings exposed to the humidity and temperature variations of the external environment. The vent has a permeable membrane allowing the inside of the box to ‘breathe’ to the external atmosphere without admitting insects and such things that enjoy a nice warm place to hide! – the ‘Short Kit’ (previously available from Sam, G4DDK) which contains the PCB, a set of 10mm coils, the SP5043 device, cable termination tags and a tuning wand. – the ‘Assembly kit’: a fully assembled and aligned preamp, with the weatherproof housing and cable glands etc. You only need to complete the mechanical assembly. 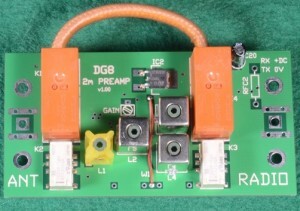 hupRF provides technical support for all D8 preamps purchased from this company, whether short kit or assembly kits. This includes all 4m and 6m models as well as 2m. G4DDK and GM3SEK continue to provide technical support for DG8-2m pre-amps that were built from short kits or bare boards purchased from them.